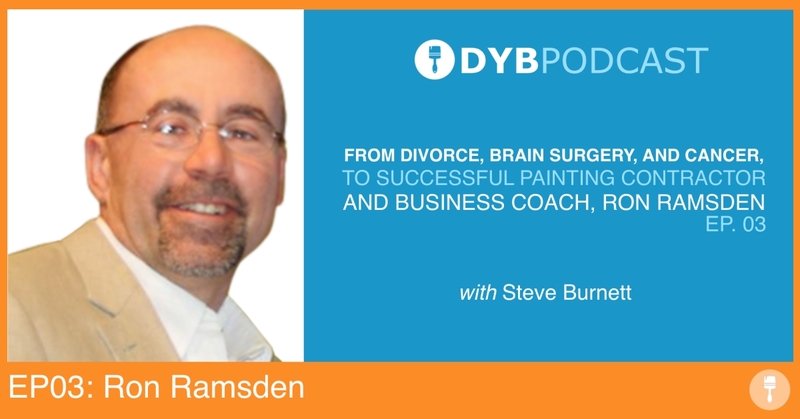 In this episode of the DYB Podcast, Steve chats with Ron Ramsden; Serial Entrepreneur and owner of Ramsden Painting. Since his early 20’s, Ron has an insatiable appetite for various entrepreneurial ventures, beginning with Real Estate Investing in his early twenties, and eventually landing in painting and managing a large team of painters. In addition, you will get a glimpse into several life-changing events that, although painful in the moment, helped shape Ron’s future in a positive manner. Enjoy this insightful and entertaining discussion. You will fall in love with Ron’s Frank and Friendly attitude toward life. [1:11] Ron’s early background, and how he developed his work ethic. [13:20] Ron’s fork in the road of life – and how he overcame a specific health challenge. [20:46] Where Ron’s entrepreneurial spark came from, following the eventual liquidation of one of his first companies. [30:55] Why Ron decided to quit real estate and go with a painting business. [46:27] What are the biggest changes Ron made in his business to free up his time?